The proliferation of smartphones worldwide is forcing rapid changes in mobile networks, according to the latest edition of the semi-annual Ericsson Mobility Report, but regional differences will persist through 2019 in terms of the pace of LTE adoption. The report leverages data traffic measures from a large base of live networks covering all regions of the world, along with internal forecasts and other relevant studies to provide insights into the current traffic and market trends. 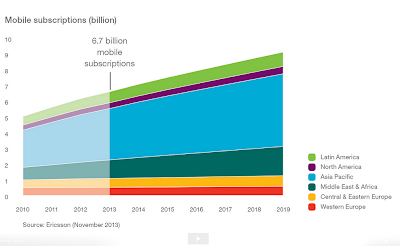 As of Q3 2013, total mobile subscriptions are at around 6.6 billion, including 113 million new subscriptions added during the third quarter. The actual number of people with their own mobiles is around 4.5 billion. Smartphone accounted for around 55 percent of all mobile phones sold in Q3 2013, compared to around 40 percent for the full year in 2012. Of all mobile phone subscriptions, 25-30 percent are associated with smartphones. Global mobile broadband subscriptions passed 2 billion in 2013, and are predicted to grow 4 times by 2019, reaching 8 billion. 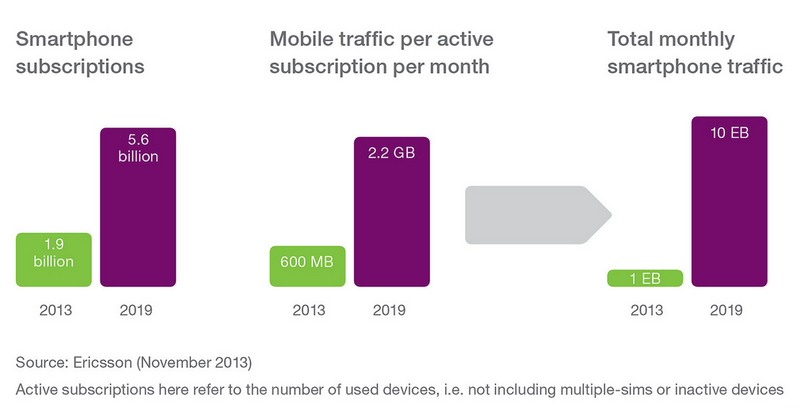 The amount of data sent by each smartphone will nearly quadruple by to 2019 -- from 600 MB per month today to 2.2 GB. Online video is the biggest contributor to mobile traffic volumes, constituting 25 percent of total smartphone traffic and 40 percent of total tablet traffic. Currently, 80 percent of all subscriptions are on 2G. 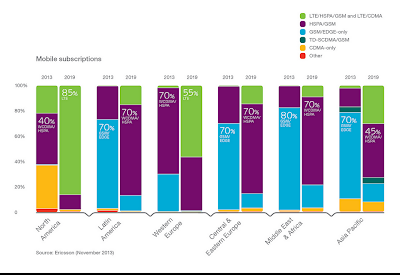 In 2019, 80 percent of the subscriptions will be 3G or 4G instead. GSM/EDGE will continue to represent a large share of total mobile subscriptions through 2019 because less affluent users entering networks ingrowing markets will likely choose a low cost mobile phone and subscription. In addition, it takes time for the installed base of phones to be upgraded. 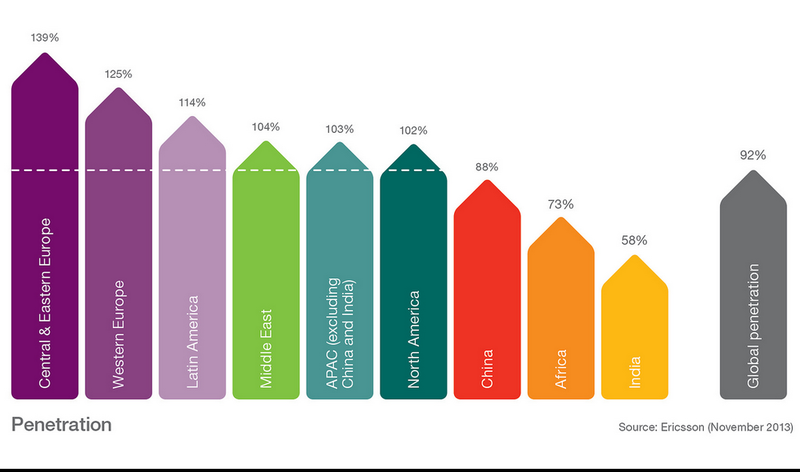 LTE is being deployed and built-out in all regions, and will reach around 2.6 billion subscriptions in 2019. Basic phones currently number around 4.5 billion today and are forecast to decline to around 3 billion in 2019. Total smartphone subscriptions will reach 1.9 billion at the end of 2013 and are expected to grow to 5.6 billion in 2019. In 2019, almost all handsets in Western Europe and North America will be smartphones, compared to 50 percent of handset subscriptions in the Middle East and Africa. The number of mobile subscriptions for mobile PCs, tablets and mobile routers is expected to grow from 300 million in 2013 to around 800 million in 2019. 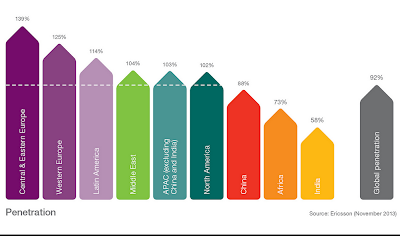 In North America, LTE will represent the majority of subscriptions in the region in 2016, growing to around 85 percent in 2019. GSM/EDGE-only subscriptions will progressively decline. In Western Europe WCDMA/HSPA is the dominant technology today. 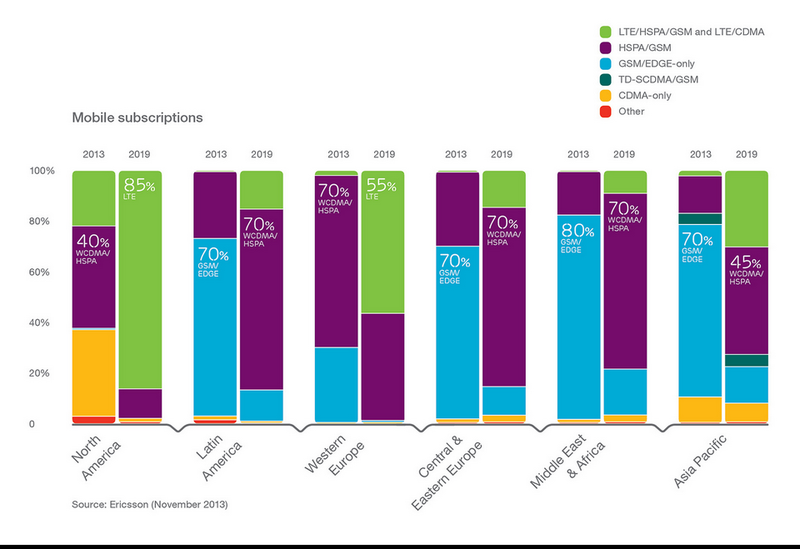 By the end of the forecast period, LTE will make up around 55 percent of the subscriptions base in Western Europe. Mobile data traffic is expected to grow at a CAGR of around 45 percent (2013-2019). This will result in an increase of around 10 times by the end of 2019. In 2013, total mobile traffic generated by mobile phones exceeded that from mobile PCs, tablets and mobile routers for the first time. The Open Compute Project, which was launch by Facebook two years ago with a charter to revolutionize data center architecture, cited progress in opening up server, storage, and data center designs. So far, the Open Compute Project has garnered more than 30 potential contributions, covering most of the network hardware stack and even some of the network software stack. In a blog posting, the Open Compute Project highlights four contributions in particular, all of them currently being considered by the OCP Incubation Committee and likely to be accepted soon. Broadcom's full specification for and implementation of an open switch -- "Broadcom has developed an Open Network Switch specification, addressing popular leaf and spine switch configurations and feature requirements, in compliance with the charter defined by the OCP networking initiative. The specification delivers the foundation for efficient, high performance, and flexible network architectures, complementing the goals of the OCP networking initiatives." Cumulus Networks' Open Network Install Environment (ONIE) software -- "ONIE, which was introduced by Cumulus Networks and is supported by networking OEM, ODM, and communication silicon vendors across the globe, is an industry standard network boot loader to install software on network switches, thus enabling a bare metal Ethernet switch ecosystem. ONIE defines a runtime install environment that supports multiple network operating system vendors at scale that -- for the first time -- effectively provides customers more control and the ability to choose when it comes to their networking hardware and software. ONIE's open install environment can be supported on a range of existing ODM switches, as well as the open network switch design specifications being developed by the Open Compute Project, ultimately enabling end users to select among different network operating systems and a variety of compatible hardware." Intel's specification for an open switch -- "Intel’s proposed contribution to the Open Compute Project network working group is a specification for a bare-metal, top-of-rack switch. The specification describes a 48x4 10/40G switch including all necessary subsystems for switching, control CPU, peripherals, external interfaces, power, cooling, and mechanical enclosure." Mellanox's open switch -- "Mellanox is expanding its Open Compute Project portfolio offering with the proposed contribution of its SwitchX-2 x86-based top-of-rack switch specification. The switch supports 48 SFP+ ports and 12 QSFP ports, enabling non-blocking connectivity within the OCP Open Rack, or alternatively, enabling 60 10GbE server ports when using QSFP+ to SFP+ breakout cables to increase rack efficiency for less bandwidth demanding applications. The new switch will be the first to enable ONIE over x86, and we expect it to dramatically improve power consumption, latency, and density and enable larger, more efficient, and more cost-effective datacenter designs." In May 2013, the Open Compute Project confirmed plans to develop an open, OS-agnostic top-of-rack switch. The effort will be led by Najam Ahmad, who runs the network engineering team at Facebook. 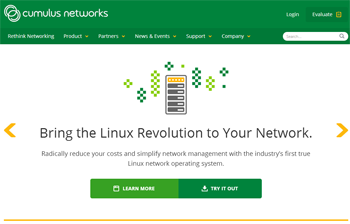 Cumulus Networks cited support for its Open Network Install Environment (ONIE) project, a network boot loader for installing software on network switches. ONIE aims to accelerate the adoption of bare metal switches by making it much easier for customers to buy and deploy standards-based network hardware. Specifically, ONIE is the combination of a boot loader and a small Linux operating system for bare metal network switches that provides an environment for automated software download, installation and provisioning.Cumulus is contributing ONIE to the Open Compute Project. In addition, the company said its open source initiative is currently supported on a range of existing ODM switches. Deutsche Telekom is acquiring GTS Central Europe for Euro 546 million. GTS has extensive network assets and data center infrastructure in Central and Eastern Europe. 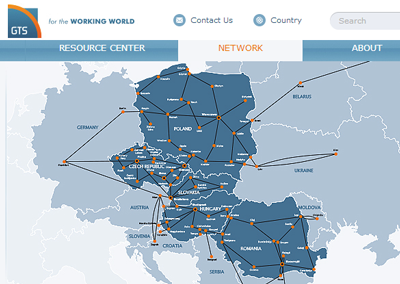 GTS operates inn the Czech Republic, Hungary, Poland, Romania and Slovakia, combining a regional fiber footprint with local networks to deliver a broad range of services. In 2012, GTS achieved revenues of Euro 347 million and EBITDA of Euro 87 million pro-forma excluding the Slovak assets, which will be retained by the sellers as part of the transaction. The company is currently owned by a consortium of international private equity firms, including Columbia Capital, HarbourVest Partners, Innova Capital and M/C Partners, who have actively developed the company over the last six years. Deutsche Telekom said the deal enhances its ability to offer pan-European telecommunication services as well as integrated products in countries where it currently maintains limited fixed-line access network infrastructure. "We are investing against the trend. GTS is a further element for developing our integrated market position comprising mobile and fixed-line network services. Strengthening our position with business customers is also a core element of our strategy," said Timotheus Höttges, Chief Financial Officer at Deutsche Telekom. The transaction is subject to regulatory approvals. In July 2013, Ciena announced that GTS Central Europe, which provides integrated telecommunications solutions and data center services throughout Central and Eastern Europe, has deployed its converged packet optical solutions to upgrade its international network to 100G. The deployment uses Ciena's 6500 Packet-Optical Platform with WaveLogic 3 Coherent Optical Processors to provide 100G capacity along its high-traffic routes in Poland, Czech Republic and Germany. The 6500 platform will support 100GE services in addition to unregenerated 100G wavelengths over distances of 1400 kms on GTS’ transport network. Procera Networks and Avvasi, a developer of QoE-driven video management and monetization solutions, announced a joint solution and strategic partnership for mobile operators. The solution integrates Avvasi’s Q-VUE product with Procera’s PacketLogic Intelligent Policy Enforcement (IPE) system. The joint offering performs video Quality of Experience (QoE) measurement in real-time to provide the communication industry’s most comprehensive determination of video QoE in service provider networks. Avvasi’s Q-VUE product will complement Procera’s core Internet intelligence offering by providing video analytics such as video QoE traffic measurement per type of device, service, network and location. The companies said this capability will enable service providers to profile their subscribers’ use of video services and create new quality-assured, revenue-generating services whose perceived performance can be benchmarked against a measureable QoE. 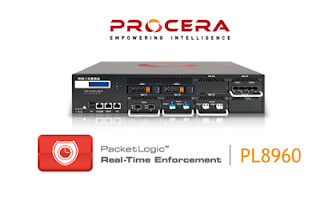 Procera will leverage its Advanced Traffic Steering capabilities to send video traffic to the Q-VUE solution, reducing the amount of hardware needed for large-scale fixed and mobile deployments. 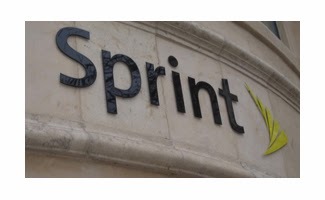 Sprint launched a Cloud Optimizer service that leverages caching technology to optimize bandwidth and performance for Microsoft Office 365 and Sharepoint applications. The service lets users enjoy the collaboration functionality of Office 365 and SharePoint online as well as read access to customer-selected public websites from virtually anywhere, even if they have limited or no Internet access. Bandwidth optimization reduces network traffic associated with Office 365 and other public websites, enabling more efficient use of a WAN. When online, users can enjoy accelerated Web browsing as cache technology reduces the downloaded content. Xilinx announced the first customer shipment of the semiconductor industry's first 20nm product manufactured by TSMC, and the PLD industry's first 20nm All Programmable device. Xilinx UltraScale devices offer an ASIC-class programmable architecture coupled with the "Vivado" ASIC-strength design suite and recently introduced "UltraFast" design methodology. 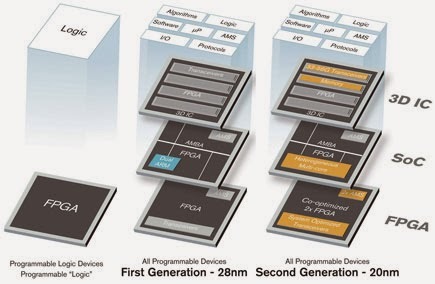 "This announcement underscores our first-to-market leadership commitment of delivering high-performance FPGAs," said Victor Peng, senior vice president and general manager of products at Xilinx. "The next generation starts now with the shipment of our new UltraScale devices, building upon the tremendous momentum we have established with our 7 series." Target applications include systems for 400G OTN, packet processing and traffic management, 4X4 Mixed Mode LTE, WCDMA Radio, 4K2K and 8K displays, Intelligence Surveillance and Reconnaissance (ISR), and high-performance computing applications for the data center. Initial UltraScale device samples are shipping now. General sampling begins in Q12014. Akamai Technologies has acquired Velocius Networks, a provider of quality of service (QoS) technology for optimizing application traffic across enterprise networks, for an undisclosed amount of cash. Velocius Networks is a privately-funded start-up with five employees. The entire team will be integrated into Akamai's engineering group in India. The acquisition is not material to Akamai's financials. Velocius was established in 2011. 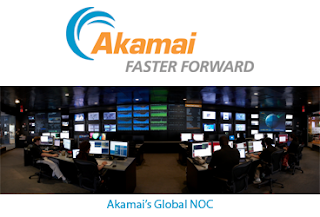 Akamai said the acquisition complements its hybrid cloud optimization strategy for optimizing IP application traffic across the Internet for remote and branch end-users. The Velocius QoS technology is expected to be integrated into Akamai's existing technology to provide traffic prioritization and shaping capabilities for IP traffic accessed over Akamai's Intelligent Platform. This plan is designed to enable Akamai to offer enterprise-class service levels for customers accessing IP applications over the Internet. "We see this acquisition as an important investment in engineering talent and technology that is intended to complement our hybrid cloud optimization strategy," said Tom Leighton, CEO of Akamai. "We believe Velocius Networks' QoS technology will further enable us to bring enterprise class of service to IP applications accessed over the Internet – an area where we have seen increased demand from our enterprise customer base." 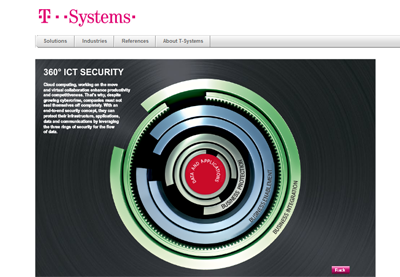 The Deutsche Telekom's T-System subsidiary announced a partnership with RSA to focus on early detection and precise strategies against attacks. Under the partnership, the companies will use their combined expertise on cyber security and protection of complex IT landscapes to analyze corporate customers’ systems and provide consulting services. The service portfolio ranges from offering an analysis of individual cyber risks for companies, advising companies on cyber security strategies and architectures and all the way to delivering advanced cyber security services. Prevention, detection and response to security incidents are equally important fields of activity in this process model. CipherCloud is now available for Amazon Web Services (AWS), enabling users to encrypt data on Amazon Relational Database Service (RDS) and Amazon Redshift, AWS' petabyte-scale data warehouse service. The solution, which offers several encryption options that can be applied on a field-by-field basis, provides AES 256-bit encryption and customer-retained key management to provide tighter control of data in Amazon RDS and Amazon Redshift. The company said these encryption capabilities enable customers to comply with the latest privacy mandates, including GLBA, PCI, HIPAA, HITECH, UK Data Protection Act, UK ICO guidance, the Australian Privacy Amendment Act and US state disclosure laws. "Organizations in the public and private sectors are increasingly tapping the cost efficiencies and elasticity of the cloud to meet data storage and collaboration needs," said Pravin Kothari, founder and CEO of CipherCloud. "At the same time, privacy regulations around the world require strong data security and compliance to protect sensitive information from hacks, accidental leaks and surveillance. 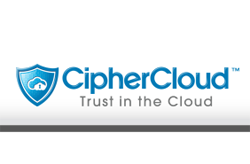 CipherCloud now makes it easy to add strong encryption to any data going to the cloud, without modifying code, or disabling cloud functionality." Additionally, customers can also integrate other cloud applications for abilities such as offloading file storage into AWS environments to dramatically reduce costs and avoid storage limitations. This extends the ability to leverage AWS for real time database needs, such as cloud bursting for structured data (e.g., names, contact details and account numbers) stored in other clouds. The process is transparent to users as CipherCloud seamlessly encrypts and forwards files to AWS for storage while sending a pointer to the file on other applications where the data remains. 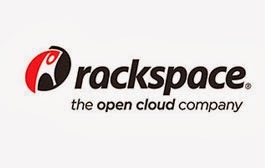 Rackspace posted Q3 2013 revenue of $389 million, up 3.4% from the previous quarter and 16% from the third quarter of 2012. Net income was $16 million for the quarter, down 27.1% from the previous quarter and 40% from the third quarter of 2012. Net income margin for the quarter was 4.2% compared to 6.0% for the previous quarter and 8.1% in the third quarter of 2012. Total server count increased to 101,967, up from 98,884 servers at the end of the previous quarter. On a worldwide basis, Rackspace employed 5,450 Rackers as of September 30, 2013, up from 5,272 in the previous quarter.